FATAL ACCIDENT.— On Monday morning an accident, which terminated fatally, happened to a waggoner of the name of Charles Fairy, in the employ of Mr. T. Turnell, of Wellingborough Mills. He was sent to fetch a load of corn from Mr. Wm. Blott’s warehouse near the London and North-Western Railway Station, and had loaded the greater part of it by the crane used for that purpose, when one of the descending sacks of corn fell down in consequence of the rope breaking. He was immediately under it, and a ball of about 14lbs. weight, attached to the lifting gear, struck him on the head and fractured his skull. Every surgical aid was rendered, but the poor fellow lingered till evening, when death terminated his sufferings. An inquest was held the following day, at the Prince of Wales, in the parish of Irchester, before W. Marshall, Esq., and a respectable jury, when a verdict of “Accidental death” was returned. It appears that the rope was and had been for some time previous in very unsafe condition, and not adequate to bearing the weights put on it. Deceased was about 30 years of age and married. He was a native of Lavendon, near Turvey, but living of late in Wellingborough. VACCINATION CASES. Mr. George Fellows, Vaccination Officer of the Olney District, attended to support several summonses against persons for neglecting to have their children vaccinated.—William Garratt, Hanslope, whose case was first heard, said he thought the practice was most cruel and dangerous, and he objected to it on principle—Order made that the child should be vaccinated within 14 days, and that defendant pay the costs.—A similar order was made on James Lay, Lavendon, who did not appear; Charles Henry Underwood, Lavendon, who did not appear; and others …. UNION CHAPEL ANNIVERSARY. – The first anniversary of the new Union Chapel, at Lavendon, was successfully celebrated on Tuesday. In the afternoon a sermon was preached by the Rev. T. A. Phillips, of Kettering, to a crowded congregation; and afterwards a public tea was held. In the evening a public meeting was held in the Chapel, and Mr. Garlick, of Bedford, occupied the chair.—Mr. Parris stated that their liabilities at the commencement amounted to £625/4/10. They had collected and otherwise obtained £444/6/9 towards that, and there remained the sum of £180/18/1 to free them from debt. He had to state, however, that they had £10 in hand so the balance really would be less than that. He thought that he could see a way of bringing down this balance to a level of £100, and this, he trusted, would be wiped clear away by the time they opened the new schools (cheers). —The Rev. T. Scott gave an earnest address; and the Rev. T. Phillips, speaking in defence of Nonconformity, said that Nonconformity with its organisation produced men of character, and he would say that the characters of the men and women who worshipped in that Chapel were nobler than those of any other in the village. LAVENDON. At the Sunday school anniversary services in the Union Chapel, Mr. Abney, of Bedford, gave two able addresses. Mr. Sidney Holmes officiated at the organ. Special hymns were sung by the choir. The chapel was full, especially in the evening, when the Schoolroom was used. Prizes were distributed by Mr. Abney to the 12 of the 14 scholars who completed the Sunday School Union Scripture examination. The collection was satisfactory. On Wednesday the teachers and scholars were entertained to tea. The evening was spent in games. William Hensman, farmer, Lavendon, was summoned for not screening the lights of a dwelling place. —P.C. Smith proved the case.—Fined 15s. John Cony, miller, Lavendon Mills, and Herbert Axby, butcher’s assistant, 57, Windsor Street, Wolverton, were each summoned for riding their bicycles without lights.—Cony was fined 10s., and Axby 7s. 6d. Walter Ives, farmer, Olney Road, was summoned for cattle straying. Evidence was given by P.C. Smith and P.S. Honour, the latter of whom stated that the cattle were continually on the metalled portion of the road, and were a nuisance. Mr. Glanley [defending] quoted a number of decisions, but the Bench were against him on the legal point. – Fined 10s. Wounded: GREEN, 7688, Pte J. (Lavendon), Bedfordshire Regiment. An old-time dance was held on Monday by the Ambulance Cadets. Mr. L. Robbins was M.C. The proceeds will go towards purchasing uniforms for the cadets. On Sunday night when about to retire Mrs. Shakeshaft, of Castle Road, fell down the stairs and injured her head rather badly. First-aid treatment was given by Supt. S. Holmes, and afterwards she was attended by the doctor. On Wednesday her condition was said to be comfortable. The wedding took place on Monday at the Parish Church between Miss Frances Louisa Tompkins, only daughter Mr. and Mrs. Sidney Tompkins, of Northampton Road, and Mr. Francis Kitchener, of Harrold Road. The bride, who was given away her father, wore a dress of suede crepe, with a bridal veil, and carried a bouquet of crimson roses. The bride was accompanied by one bridesmaid, Miss Joan Wooding (a friend), who wore a dress of mauve crepe-de-chine, with a black picture hat, and carried a shower bouquet of pastel shaded sweet-peas. Mr. Arthur Kitchener (brother of the bridegroom) was best man. A reception was held in the Ambulance Hall, where over fifty guests were entertained. The honeymoon is being spent at Chatham. Sunday was Hospital Sunday at Lavendon and was organized by the Hospital Week Committee in aid of Northampton Hospital. Soon after 2 p.m. a procession headed by the Dodderidge Memorial Band and comprising the ambulance contingents from Newport Pagnell, Olney, Bedford, Harrold, and Carlton, Turvey, and Lavendon, the Olney Fire Brigade, the Hospital Week Committee, and cadets assembled at the New Row, Northampton Road (under the direction of Mr. L. Robbins). The procession marched as far as Harrold Road corner, returning to church for service. The special service was conducted by the Rector, who also gave the address. The church was so full that seats had to be placed up the aisles. After the service the process was reformed around the War Memorial, and after the National Anthem had been played by the Band it was dismissed. The Band and visitors were then entertained to tea, and then after evensong musical selections were given the Band round the Memorial. The collections during the day amounted to over £7. Mr. J. Bristow, Head Master of Lavendon School, has been elected to represent East Anglia on the Rural Schools Committee of the National Union of Teachers. The second of this season’s grass Grand Prix motorcycle races, promoted by the Rushden and District Query Motor Club, was held at Costor Pits, [south of Lavendon Mill] near Newton Blossomville, on Sunday. There were a large number of entries, riders coming from London, Oxford, Hanworth, Dunstable, Luton, Bedford, Northampton, Wellingborough, and Rushden. Although the weather was none too good a large crowd gathered to watch some thrilling and daring riding round a grass course consisting of steep descents and sharp gradients with long flat straights. The results were very close. LAVENDON’S VICTORY WEDDING GROUP Lavendon’s celebrations proved a success. An open fancy-dress parade was organized by Mr. A. White and 47 entries were judged by Mrs. T. A. G. Budgen. The results were: 1 – nine young ladies of the Youth Organization in a Victory wedding group. 2 – Rosie Panter as the village pump, 3 – Ann Johnson and Joan Kitchener as Land Army girls, 4 – Jane Kitchener as a sunflower. 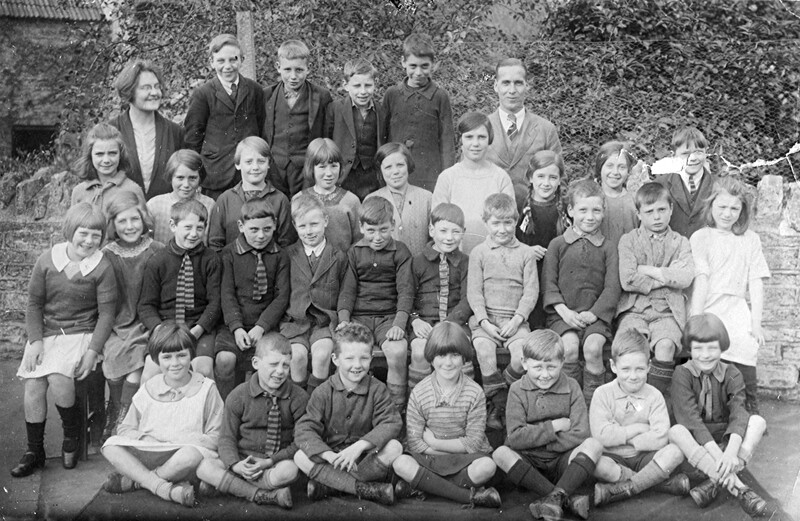 All children under 15 were entertained to tea at the Ambulance Hall, by courtesy of the Rural District and Parish Councils, and were served by members of the Women’s Institute, W.V.S., and other helpers. In the evening, under the auspices of the British Legion, a Bedford party gave an enjoyable concert in the schoolroom, at which the old people had front seats. To conclude the day a dance, with Mr. Charles Smith supplying the music, was held in the schoolroom. All the outdoor entertainments were cancelled. On Whit-Sunday members of the British Legion paraded with their standard at matins. The Rector, who is hon. chaplain of the branch, preached. The lessons were read by Major M. E. Farrer. of Brayfield House. Offerings amounting to £2 10s. 6d. were given to the Soldiers’, Sailors’, and Airmen’s Help Society. An inaugural meeting of the Women’s Section of the Lavendon branch of the British Legion was held at the Ambulance Hall on 14th June. Mr. S. C. Holmes (Chairman of the Branch Committee) explained that the meeting had been called to start a Women’s Section, which had been promised on many occasions. Col. W. Scott-Evans, O.B.E. (Buckinghamshire Hon. Secretary), welcomed the ladies into the Legion, and wished them every success. Mr. S. C. Holmes said that the men’s branch would transfer £5 to the Women’s Section to enable them to meet inaugural expenses. Nineteen members were enrolled. It was reported at a meeting of Newport Pagnell Parish Council on Wednesday that the four Council houses at Lavendon should be completed in about three weeks.